Preparation time: About 25-30 minutes, including skinning and boiling the potatoes beforehand. Skin and boil potatoes. I actually cheated and used a vacuum-sealed pack of skinned and pre-cooked baby potatoes (although I did need to rinse off the ascorbic acid to separate the potatoes–ascorbic acid is a form of Vitamin C often used as an antioxidant to prevent produce from browning). Set the cooked potatoes in lukewarm or slightly cool water to cool them down to the touch, if necessary. Then slice the potatoes into thin discs. Lay out in a casserole dish. In a small pot, mix over low heat a small dollop of olive oil, and enough cream to melt the block of cheese, which should be cut up into small pieces to help speed up the melting process, stirring constantly. Add butter if desired. Salt to taste. 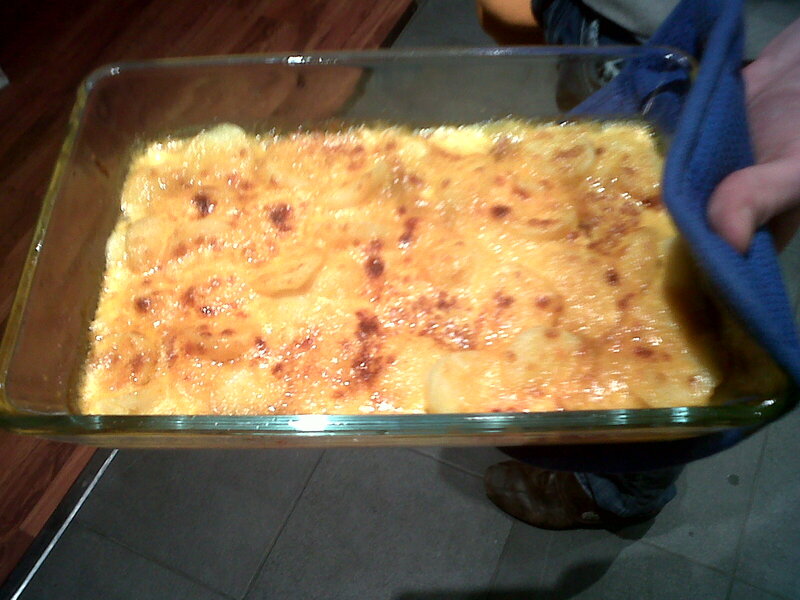 Pour cheese-cream mixture over potatoes so that all potatoes are covered. Take a couple of small handfuls of bread crumbs and lightly dust over potatoes. Bake at 450˚F (250˚C) for 10-15 minutes or until the tops of the potatoes are browned. Remove and let cool for a few minutes before serving. This dish was a surprisingly simple hit with my friends, and a nice option if you have to throw something together quickly but only have a few ingredients! If you have more time and more ingredients, feel free to add additional spices, some flour to thicken the sauce, onions, chopped peppers, or whatever you prefer!